I’m thinking again about Anita Hill’s blue dress. I wrote about it, and her, and Freida Mock’s engrossing documentary film, titled simply Anita, last year when the film played at the Seattle International Film Festival. Now, Anita is in theaters, including Seattle’s Sundance Cinema. Go see it. Time-travel back to October 1991, when we weren’t yet accustomed to having a man accused of sexual harassment on the Supreme Court. But back to the dress. No matter how hard we all try to be less attached to the things of our lives, objects do have power. Anita Hill knew what her pale blue dress said, and so did we: Professional. Tasteful. Modest. When I remember my mother, I often picture her in a dress that couldn’t be more different than the one Hill wore to that infamous Senate hearing. My mom’s dress was Tabasco-red. It was fitted with a flared skirt. Spaghetti-strapped. A print of tiny white racehorses galloped across it. That dress was shorthand for who she was then: a youthful, single, 49-year-old woman with a great eye for the right outfit, one that pushed the edge of daring without going over it. A red dress says: Here I am. The star of Peter Brook’s stage adaptation of a South African story called The Suit, Nonhlanhla Kheswa, was resplendent in a red dress that was a ringer for my mother’s, only without the racehorses. When she stepped to the front of the stage and sang Miriam Makeba’s haunting “Malaika,” it was as if the red dress was powering her voice. Writer Can Themba’s premise in The Suit is all about the symbolic power of clothing: A husband punishes his adulterous wife by propping her lover’s left-behind suit in a chair at the table at every meal, whether guests are present or not. But Kheswa wears her red dress not in the manner of a sultry sinner, not in the manner of a scarlet A, but as a red badge of courage. As her way of saying: my husband wants to shame me, but I won’t sit quietly in the corner. He will never forgive me, but I will forgive myself. Not only will I sing, I will sing in a red dress. I am Malaika. I am an angel in red. 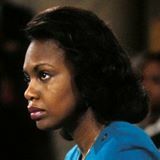 Testifying before a Senate committee, Anita Hill drew from a similar core of courage, but in a different, though no less powerful, dress. I wonder if my mom’s red dress was her badge of courage. Her way of saying: I may have lost three husbands—two to divorce and one to death—but this is who I still am: a woman radiant and confident enough to wear a red dress. Read the Restless Critic’s review of Anita. Read Seattle Times critic Misha Berson’s review of The Suit. Go see them both, if you can. The Suit ends Sunday but is opening soon in Los Angeles, San Francisco and Nashville.